Shanti Travel has been a proactive supporter of and exhibitor in Christmas events not only in Delhi but in Mumbai as well. After the grand success of the German Christmas Fest last year, Shanti Travel participated in the German Christmas Fest 2013 in Mumbai at the Royal Western Turf Club in Mahalaxmi Race Course. 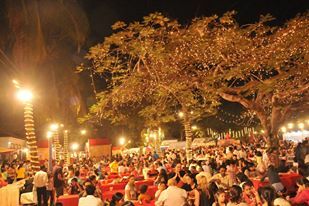 Organized by the Indo – German Chamber of Commerce, the German Christmas Fest is a jolly attraction for expat families living in Mumbai as well as Indian families to kick-start the Christmas celebrations. The event was organized during a weekend on the 30th November and 1st December in 2013. The venue is a great space to enjoy the weekend with something to do for everyone in the family. There is enough enjoyment for kids with sweet shops, souvenir shops, games, magic shows, and live music. Parents could enjoy different drinks like wine, German beer and food along with live band performances by famous rock bands. This is the perfect setting to enjoy your weekend with food and fiesta. The venue is more important due to the horse racing ground and the races organized here. One can enjoy this game at the same time as well. Shanti Travel also participated in the event with an innovative approach to offer travel ideas and gifts for the families visiting the venue. There was a great response from the families for the Shanti Travel educational colouring book and pencils for kids. The colouring book gives kids the opportunity to enjoy colouring while learning more about Asian countries and culture. Kids can colour in monuments and cultural symbols of all the countries we operate in including India, Srilanka, Maldives, Nepal, Bhutan, Burma and Indonesia. The Shanti City Guide was also a success with expat families who wanted the Mumbai Guides. They appreciated the well compiled information that had a special focus on expat requirements.